Happy February! Throughout the month, we'll be sharing tips, tricks, feedback and stories about anything and everything related to diabetes and LOVE. To kick off our blog theme around the month of love, we thought we'd get started with a highly controversial topic: 🍫 CHOCOLATE 🍫 Okay, okay -- it may not be the raciest topic out there (we'll get into those later), but chocolate is super prevalent this time of year. So how do we people with diabetes indulge? Turns out, there's a pretty great option out there that you've probably never heard of: Raw Amour. It's raw, organic, gluten-free, paleo, low-glycemic CHOCOLATE. And if that's not enough to pique your interest right there, these little truffles were created specifically for people with diabetes. Yes, you read that right -- Dr. Marc Rosenbaum cooked up a new chocolate treat for PWDs with a glycemic index value close to zero. Meaning fewer BG spikes and less insulin to take (if any at all!). As a person with diabetes, I often find it difficult to steer clear of the sweet treats, especially around holidays like Valentine's Day. But when I heard about Dr. Rosenbaum's miracle sweet, I just had give it a go. A few of us in the One Drop office sat down to review Dr. Rosenbaum's creation. As for me, compared to other dark chocolates out there, this is my new favorite. It has this smooth, velvety sweetness to it that should quell any chocolate craving. The original with the cashew butter in the middle is melt-in-your-mouth delicious, but I particularly liked the coffee option - still sweet, but a little salty, and some crunchiness mixed in from the coffee beans. 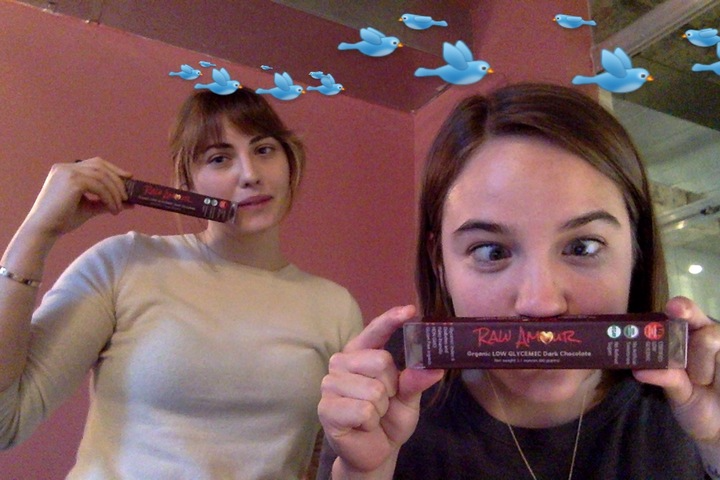 So, basically, Raw Amour chocolate is delicious. But how did Raw Amour impact our BGs??? With Jenn's first round, she consumed 4 truffles (12g of carbs) and bolused 2 units. She had a before BG reading of 94 mg/dL. And 2 hours after Raw Amour consumption? Drum roll please... a BG reading of 122 mg/dL! No spikes, no problems. In day 2 of our trials, Jenn was 232 mg/dL and stuck to just one truffle (3g of carbs), and only gave herself insulin to cover her high BG. Result? A solid 132 mg/dL two hours later. I started with a BG of 82 mg/dL in my first trial run. I consumed a total of 3 truffles (9g of carbs) and didn't take any insulin. The result? A practically perfect reading 2 hours later of 102 mg/dL. The next day, with a starting BG of 132 mg/dL, I stepped things up a notch, consuming 4 truffles (12g of carbs), and I bolused 0.75 units. Two hours later I landed a 127 mg/dL, with no spikes to speak of. Would we recommend Raw Amour? Check out the website: http://rawamour.com/ NOTE: We write these reviews to highlight products we like that help support a healthy lifestyle. We do this as service to our users. We are not paid for any reviews, nor do we accept payment for any products we review.